Kelloggs Australia has a visual effects-laden TV ad showcasing the wholegrain version of Kelloggs Cornflakes in the context of a variety of breakfast settings over the years. 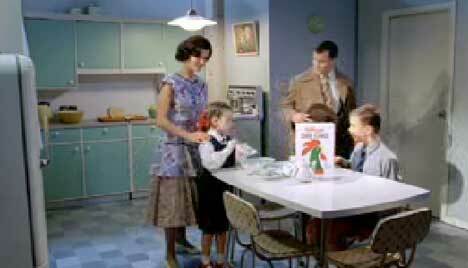 Starting in the 1950s, the ad moves through the decades showing Australian families at breakfast time. As the scenes, hairstyles and fashions change, one thing remains constant throughout – the packet of Kellogg’s Cornflakes on the dining table. The whole ad was shot in-camera, meaning the sets were manually changed while filming, rather than being added as a special effect in post production. Co-ordinating roughly 100 cast and crew was a massive logistical exercise, requiring hours of practice and a lot of patience from all involved. The crew had to not only ensure that the scenes change seamlessly from one generation to the next, but also to ensure that whilst the physical sets were transitioning, each of the different families entered and exited the frame at just the right time to maintain the smooth flow. Kellogg’s marketing manager Damian Facciolo sees this ad as a major turning point in the brand’s history. “Kellogg’s Cornflakes have always been a quintessential part of Australian breakfasts. With consumers increasingly wanting to incorporate more variety in their diets, it became clear to us that the time was right to introduce a wholegrain variant,” he said. The Kelloggs Changing Rooms spot was developed at JWT, Sydney by executive creative directors Jay Benjamin and Andy Dilallo, art directors Gary Showell and Adam Fine, copywriters Gary Showell and Sarah Troon, and agency producer Amanda Slayter. Filming was directed by Nic Finlayson via Film Construction, Auckland, with director of photography Ian Paul and producer Phil Liefting. Post production was done by Andrew Clarkson at Bean Colour and at Postmodern, Sydney. Editor was Bernard Garry at The Editors. Music was provided by Keith Ballantyne at Perceptual Engineering. Sound Design was by Jon Marsh at Sound Reservoir.